Everyone wants to know when Milwaukee will be releasing their new M18 XC5.0 Extended Capacity Battery Pack and you should be happy to learn that they will be coming out next month (November 2014). This means there will be plenty of time for you to add them to your Christmas list. You might be surprised to learn that the new Milwaukee 5.0 Ah battery got more than just boost in capacity and runtime, but I will get to that later. Milwaukee Tool has been at the forefront of pushing the limits of cordless tools, in part, thanks to their battery technology. Their new M18 RedLithium XC5.0 Extended Capacity Battery Pack is no exception, causing Milwaukee to one-up themselves again. Yes, the new Milwaukee 5.0Ah battery is more powerful (20%) and delivers longer runtimes (2.5x), but that is not all. 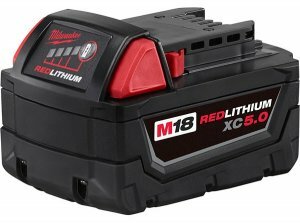 This is why Milwaukee says their new M18 XC5.0 battery “will deliver more work per charge and more work over the life of the pack than any other 18V battery on the market”, a pretty bold claim. In fact, they say the new battery provides 2x more life than standard lithium-ion batteries. The Milwaukee M18 RedLithium XC5.0 Extended Capacity Battery Pack will be available this November and will be sold as an accessory that is compatible with other M18 cordless tools. Unfortunately it doesn’t look like it will be offered in any kits just yet.